Crime fiction. Historical fiction. Thriller. Police procedural. 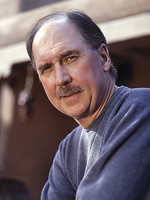 All can describe Murder As A Fine Art by David Morrell, author of at least twenty-nine novels and six non-fiction books, including First Blood and Rambo. 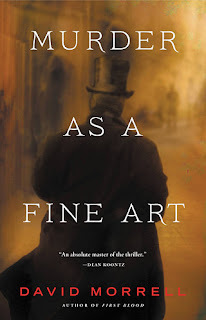 Despite his success as an author, Murder As A Fine Art is my first experience with Morrell. The book, set in 1854 London, was inspired by the works of author Thomas De Quincy, who is most well known for a series of essays Confessions of an English Opium-Eater, which was later published as a book. The essays are autobiographical, and tell the story of a life lived mostly while addicted to opiates. At the time, in Victorian England, a book so open about addiction and life's hardships was very rare. However, it was the essay entitled On Murder Considered as one of the Fine Arts, in which De Quincy satirically detailed a series of murders in 1811, that inspired Mr. Morrell's novel. Mixing the De Quincy's account in On Murder with De Quincy's experiences described in Confessions, Mr. Morrell wove an intricate web of fact and fiction to produce Murder As A Fine Art. In it, there is a murder of a shop-keeper and his family that appear to be copies of the 1811 murders. Coincidentally, the murders occur as De Quincy, who normally lives in Edinburgh, is in London promoting his work. London Detective Inspector Ryan suspects De Quincy after learning that the crime scenes are so similar to the book written by him, particularly because of the passion, knowledge, and lightheartedness in which On Murder is written. However, Det. Inspector Ryan quickly comes to believe differently and works hard with De Quincy, his daughter Emily, and ambitious London Constable Becker to find and stop the real killer. Murder as a Fine Art is packed with action starting in the first chapter. Witty and humorous dialogue, even about brutal murder, was also interspersed throughout the book. The De Quincy character and his daughter are out of place in 19th Century England, before their time, and the reaction of others to them works both in their favor and against them. I enjoyed Mr. Morrell's presentation of 1854 police investigations and how although things have changed so much since then, the investigative processes, politics, importance of rank and class, and more have remained the same. In addition to the plot and wealth of interesting and colorful characters, I found an underlying social statement about 19th Century England: the division of the classes and the sexes; the existence of two Londons, those with wealth and those without; the influence of big business in government policy; the influence of the drug trade in England and in the Orient; pollution, mob mentality and vigilantism and the British governments role in each. While the book was set in London in 1854, many parallels could be applied to similar issues today: the growing gap between the rich and poor, corporate involvement in politics and government, the drug war, global warming, and the rise of the Tea Party. One of many indicators of a good book to me is if I don't want it to end. Mr. Morrell achieved this in Murder As A Fine Art. I stepped out of my comfort zone when I chose it, but I'm glad I did. I think you will be, too.